September 1, 2015 – Zodiac has been celebrating a special galley milestone, which coincides with a rather special galley unit. It has now been 60 years since Zodiac Premium Galleys (previously known as Sell GmbH), began producing galleys for twin-aisle aircraft. A 60th anniversary is a big deal in itself, but on August 31, the company celebrated another milestone in its history with the delivery of its 50,000th galley unit, The unit was bound for an Etihad Airways A380, and is a great example of just how far galley design has progressed over the years. 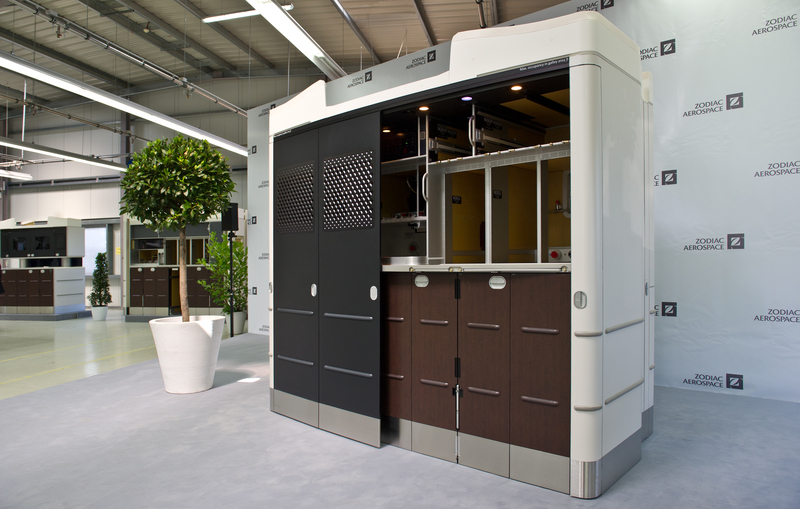 Incredibly, the bespoke unit (pictured above) has been created for the all-economy class main deck. The Etihad Design Consortium, comprising Honour Branding, Acumen and Factorydesign, worked hard with Zodiac Premium Galleys to create galley spaces that feel less like industrial kitchens and more like boutique hotel lobbies as you walk through. For more details, see our Etihad A380 feature HERE. “We are very proud of being part of such a visionary concept like the one that has been realized for the Etihad A380 cabin”, said Olivier Zarrouati, CEO of Zodiac Aerospace. The galley program started in 2011 and the first aircraft was delivered in December 2014.